Enjoy 2D/1N stay at Awana Hotel for only RM150 when you spend RM500 or above at Genting Highlands Premium Outlets. Step 1: Spend RM500 and above at Genting Highlands Premium Outlets. Step 2: Show your receipt at Genting Highlands Premium Outlets' Information Center. Step 3: Use the promo code and book online. Shoppers who spend RM500 or above at Genting Highlands Premium Outlets, in a single receipt or accumulated receipts in a single day are entitled to redeem the offer. Shoppers are entitled to a maximum of two (2) rooms OR two (2) night’s stay if they spend RM1,000 or above in a single day. Bookings must be made one (1) day prior to check-in date. 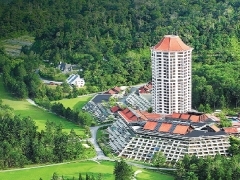 Bookings must be made via the Resorts World Genting website on www.rwgenting.com. Full payment to be settled through the guest’s credit card only upon booking confirmation. Shoppers are required to enter the Voucher Code provided in the voucher before proceeding to make their payment to enjoy the special rate. The confirmation of the reservation is subject to room availability. All international tourists (non-Malaysians) will be charged a Tourism Tax of RM10 per room per night in accordance with the Tourism Tax Act 2017. Tax will be collected upon check-in.